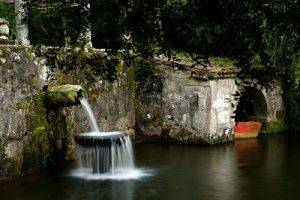 Holiday home for 9 people Galicia, your home is Casa Da Carballeira, surrounded by “Carballos” (Robles) we are in the heart of Galicia in a quiet and peaceful countryside where you can disconnect from your daily routine, where noise of awakening is a thing of the song of the birds. You will be able to realize quiet hiking routes enjoying a totally natural landscape and surrounded by autochthonous vegetation. Holiday home for 9 people Galicia, come and meet the tasting of cider offered by our environment as well as the multi-adventure package we offer.Holiday home for 9 people Galicia, for this Casa da Carballeira has a complete massage menu, both for treatment and relaxing. You also have at your disposal an equipped kitchen, where you can cook homemade and typical food of the area, as well as a large living room to spend very good times with family or friends, with games and music to enjoy yours. We also have a super large farm where your children can run and enjoy the freedom and tranquility of nature.Holiday home for 9 people Galicia, so you can find your peace our house offers you 4 double bedrooms with bathroom, 2 of them have a double bed and the other 2 have single beds. It is the ideal rural house in Galicia for children and the elderly.The bathrooms all have a bathtub where you can enjoy a relaxed hot bath with salts.If you want to enjoy your holiday looking for a holiday home for 9 people in Galicia, CASA DA CARBALLEIRA is your best option.Rural vacations in the best environment. Ideal for family with children. Maximum tranquility in the environment, and surrounded by nature. Very close to the beach, you can meet several spectacular Galician beaches. The rural house is half an hour from the beach and 18 minutes from the Rías Baixas. Known for its cuisine, and its pleasant surroundings, peaceful and quiet, very natural!Bring your children! to your family!! you will not regret! because casa da carballeira has all the characteristics to spend your family holidays. Surrounded by peace and tranquility, where you can breathe pure air typical of a natural landscape. Holiday home for 9 people Galicia, a few km from the Galician capital itself that attracts so many pilgrims and visitors, will it be for something? do not you think?